A group walks along a paved pathway in Bethel, Maine, and includes John Holliday, fourth from left wearing a red shirt. 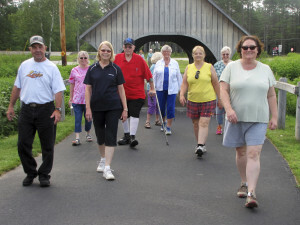 Above, a group of people walk along a paved pathway in Bethel, Maine, including John Holliday, fourth from left wearing a red shirt. Bethel is among communities across the United States working to become more age-friendly. At right, Caroline Gould, left, and Al Cressy walk to Cressy’s car after he volunteered to drive her to Auburn.